The newest version of the patented, miniature fiber-optic link and signal conversion solution is a dramatic evolution from previous generations, with interlocked mounting, centralized power and built-in OLED monitoring that improves ease of use and systems management. 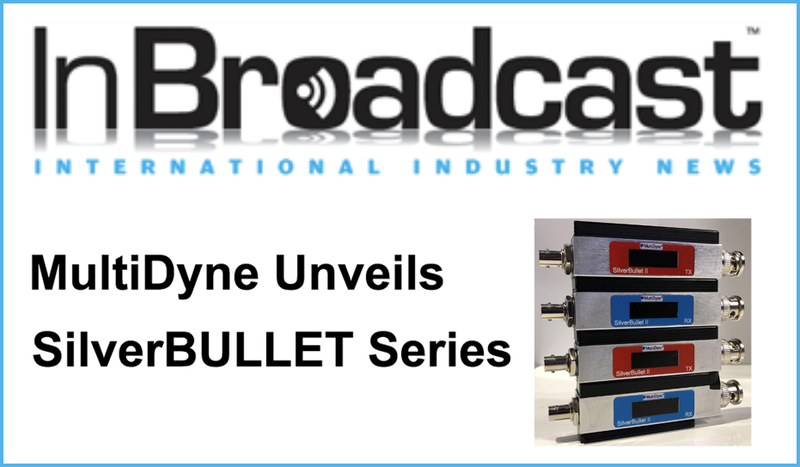 MultiDyne’s SilverBULLET transmitters and receivers are highly portable and economical, making them equally useful for fixed links or last-minute SDI feeds. The latest SilverBULLET generation is 12G-capable for high-bandwidth, single-link transport to and from any video source. Built-in cable equalization and re-clocking optimizes signal integrity across all short- and long-distance transport, removing the presence of jitter from existing signals. The product’s integrated OLED monitoring provides consistent readings on jitter rates, signal type, optimal power and more. The daisy-chained mounting options and centralized power are key differentiators from previous SilverBULLET generations, according to MultiDyne President Frank Jachetta. At only three inches in length, the SilverBULLET connects to the back of any camera, monitor or another video source, with the ability to add more units without additional cabling.